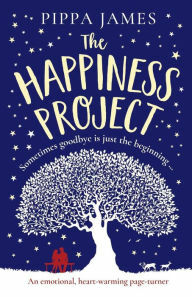 Sometimes I need a break from all the psychological thrillers I tend to read, so I was excited to pick up Pippa James's The Happiness Project. I was looking forward to an uplifting novel about characters who are beginning their own paths to happiness. While this IS what the book is about, I found myself not very uplifted at the end. Alison, Kate, and Frankie are our three main characters on this growth journey. All have either a boyfriend or husband and children but feel they need something more in their lives outside of that. Alison gets the ball rolling on New Year's Eve by suggesting they begin a Happiness Project to get out of their comfort zones and begin living life to the fullest. This all sounds great on paper, but I think there are two main problems with this story that I found. First, the Happiness Project itself is really only mentioned a few times throughout, mostly at the beginning. Even though these characters are supposedly on this experience together, there are not many checkpoints along the way. Because of this, the title of the book seems oddly out of place. The other issue I had was with Kate's thin character development. Alison and Frankie both scored major accomplishments, but Kate started out as a doormat and remained one. It's great to be a wonderful wife, mother and friend, but when one of your "friends" treats you poorly (namely Natalie), and you don't eventually tell her off, the reader is left unsatisfied. Which is, unfortunately, how I felt about The Happiness Project.